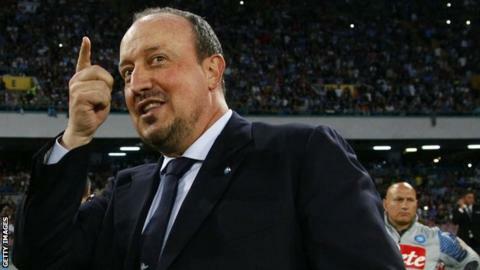 Rafael Benitez: Will he be a success at Real Madrid? Rafael Benitez's confirmation as Real Madrid's new manager has been met with scepticism by significant sections of the Bernabeu club's fans. As he confronts the daunting task of improving Los Blancos's disappointing record of just one league title and one Champions League crown in the last seven years, Benitez has several burning issues to address. Here we examine the former Liverpool and Chelsea manager's most pressing priorities - starting with the challenge of getting the doubters on his side. Benitez, it is fair to say, is a far from popular choice as new manager among Real fans, a significant proportion of whom didn't want predecessor Carlo Ancelotti to be sacked in the first place. The attitude of many supporters - even loyal ones - was demonstrated a few days ago when Real's vice-president Eduardo Fernandez De Blas was heckled about Ancelotti's departure and Benitez's impending arrival during a speech to an official fan club. That hostile atmosphere reflected an end-of-season poll held by Madrid-based newspaper AS, which saw 44% of voters saying they wanted Ancelotti to stay in charge. Jurgen Klopp was second, with third place going to former Real midfielder Michel, who left Olympiacos in January, and Benitez only fourth, attracting less than 8% of the votes. And the media's doubts were evident last week in a Marca article under a headline which could be politely but loosely translated as "Rafa? Don't wind me up", playing on a phrase famously used towards assistant referee Rafa Guerrero in the 1990s in a kind-of Spanish version of "Do I not like that". The article starts by acknowledging that Benitez is a "good manager" but proceeds to list no less than 18 reasons why he is an "extremely risky bet" for club president Florentino Perez, suggesting that he is "stigmatised" as a defensive coach and fearing that onlookers will find it "difficult to give him the benefit of doubt". Patience is rarely a virtue of the demanding Real fans or media, who are already suspicious of Benitez's ability to change their team's dynamic after a season with Napoli which saw him finish fifth in Serie A and - more pertinently for Spanish fans - lose against Athletic Bilbao in the Champions League preliminary round. Of course, Benitez is no stranger to being unwanted - he was subjected to torrid abuse by many Chelsea fans after being appointed at Stamford Bridge in 2012, but slowly won over some of the dissenters and enjoyed a degree of success by winning the Europa League at the end of the season. Benitez's uncomfortable experience with Chelsea will stand him in good stead for the cool reception he will receive from Real fans, as well as their ongoing relentless dissection of every decision he makes. Real fans weren't the only ones who wanted Ancelotti to stay: many of the club's players also expressed their displeasure at his departure. Star forward Cristiano Ronaldo was Ancelotti's most prominent advocate, posting a defiant message on social media - stating "hope we work together next season" - just two days before the Italian's sacking. When Benitez reports for pre-season training with his new team, then, he will have to work hard to convince his group of superstars, astronomically paid and with egos to match, that they should follow his methods. As much as tactical plans, that applies to the emotional tone which Benitez sets for his players - the kind of mental attitude he will attempt to instil. Neither of his immediate predecessors found that task easy, with Jose Mourinho instigating a fierce and relentlessly competitive atmosphere of conflict: with Barcelona, with referees, with the media, and even within the club. Ultimately, that intense and aggressive attitude contributed to Mourinho's downfall after several months of bitter in-fighting. Ancelotti's approach, in contrast, could be summed up by one of his most commonly used words: balance - both on the field of play, where he wanted a team that was neither gung-ho nor defensive, and also in a general demeanour of rational self-control rather than emotional outbursts. But in the end, they became perhaps too calm and deliberate when a bit more fire and passion was required, with Ancelotti left to defend himself against allegations of being too soft. In a country where debate and discussion are important parts of everyday life, the tone and content of Benitez's rhetoric during his first few weeks in charge will be crucial in determining to what extent he succeeds in making an emotional connection with his players, as well as with the fans and the media. Where does Ronaldo fit in? There are, of course, also tactical questions for Benitez to address, not the least of which is the question of where Ronaldo should play. After a season which saw him score 61 goals, including a second-highest ever La Liga tally of 48, the Portuguese forward, despite turning 31 midway through next season, is clearly still a phenomenal talent and he will be an integral part of Benitez's plans. But Ronaldo is now a different player from the marauding winger, sprinting 40 yards before crashing home long-range bullets, who Premier League fans became accustomed to seeing during the end of his time with Manchester United. Increasingly, he is now more of an out-and-out striker, occupying a central position and linking play with the midfield before sniffing out opportunities inside the penalty box. Only five of those 61 goals last season were scored outside the area, while another revealing statistic is Ronaldo's average of just 3.2 attempted dribbles per game in La Liga, compared with 8.2 by Barcelona's Lionel Messi. This means that, rather than playing on the left-hand side of a front three, Ronaldo may be better served by being repositioned as a more central striker either alongside, just behind or maybe even instead of Karim Benzema. Benitez is renowned as a deep tactical thinker and his ability to get the most out of one of the most prolific goalscorers in history will be fundamental to Real's success - it will be fascinating to see how he intends to go about it. What does this mean for Gareth Bale? Gareth Bale finished last season under a cloud, enduring a disappointing second half of the campaign with the result that many Real fans, although largely not downright hostile, are at least now seriously questioning whether he is worth a place in the team. Interestingly, Benitez made what could be regarded as a disparaging comment against Bale when the Welshman joined Real in 2013. Asked whether the deal represented value for money, Benitez argued that if Bale was worth 100m euros, his Napoli star Marek Hamsik was priceless. In fairness, he appeared to be primarily underlining his belief in Hamsik's quality rather than criticising Bale, but that comment has already been dredged up by the Spanish media and further underlines the general impression that Bale's future is more uncertain than any previous time during his stint at the Bernabeu. Bale's particular problem is that he faces very tough competition for places, with Colombian international James Rodriguez and Spanish golden boy Isco providing further options as attacking midfielders and both enjoying better personal campaigns than Bale. If Benitez operates with his usual 4-2-3-1 formation, it's difficult to see how all three of them can play at the same time - unless, as speculated above, he drops Benzema to play Ronaldo as a lone frontman. Counting in Bale's favour, however, is the fact that Bale remains a personal favourite of unusually influential club president Perez, who would not take kindly to the sight of his record signing sitting on the bench. So barring a sudden and unexpected change of heart from Perez, which cannot be ruled out, Bale will still be at Real Madrid next season and he will have plenty of chances to rediscover a positive vibe, especially considering Benitez's fondness for rotating his team selection. But he will have to start the season well to avoid placing Benitez under heavy pressure to drop him for big games. Casillas, Navas... or De Gea? An even more pressing concern for Benitez is addressing the goalkeeper debate which has been raging ever since December 2012, when then-boss Mourinho controversially dropped Iker Casillas for previously unheard-of Antonio Adan (who was last week promoted back to the top flight with Real Betis) and subsequently signed another goalkeeper, Diego Lopez. Although Casillas was reinstated by Ancelotti last season, he made a series of high-profile errors and regularly faced harsh criticism from previously adoring Bernabeu fans who wanted summer signing Keylor Navas, so impressive in last summer's World Cup Finals with Costa Rica, to be given a chance. Now another goalkeeper is coming into the equation, with David De Gea hotly tipped to leave Manchester United and return to his home city this summer. But Casillas, who turned 34 last month, used a radio interview last week to insist that he has no plans to leave and will compete with De Gea for his place, even claiming that he would like to follow the example of fellow keepers such as Gigi Buffon and continue playing into his late thirties. Assuming De Gea is signed, which most people in Spain are now regarding as inevitable, Benitez has a stark choice to make: stick with Casillas, or install the new arrival straight away? And if De Gea is his selection, should Casillas be placed on the bench or encouraged to leave, with Navas retained as back-up? For his own sake, Benitez should act quickly and decisively. Heading into his first season with questions about Casillas hanging over every game is the last thing he needs, but that's exactly what will happen unless he states his policy loud and clear from the outset.